Carmel-by-the-Sea is a charming enclave nestled along the California Central Coast, but with its upscale boutiques, art galleries, wine tasting rooms, and eateries, it’s not cheap. That said, there are still relative bargains to be found among the many boutique hotels and bed and breakfast inns in the village. 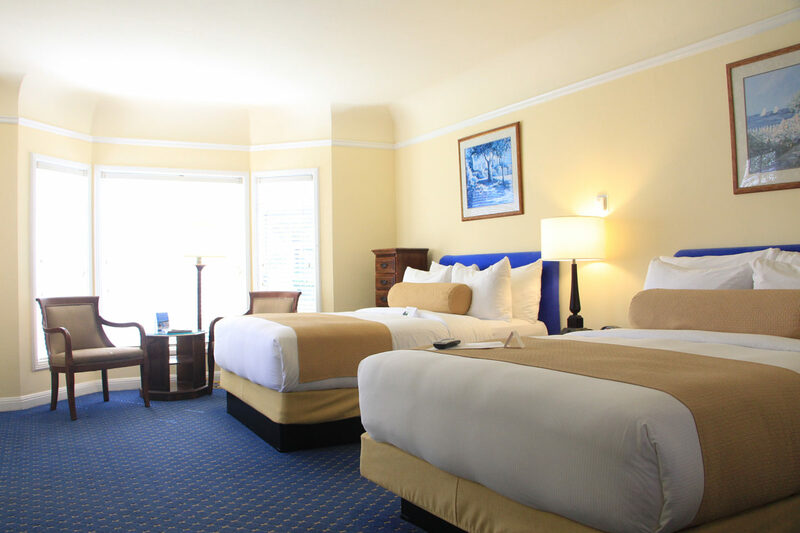 Below, I’ve listed my picks for affordable lodging in Carmel-by-the-Sea, all of which are within walking distance of Carmel’s attractions and all with rates starting below $200 per night. 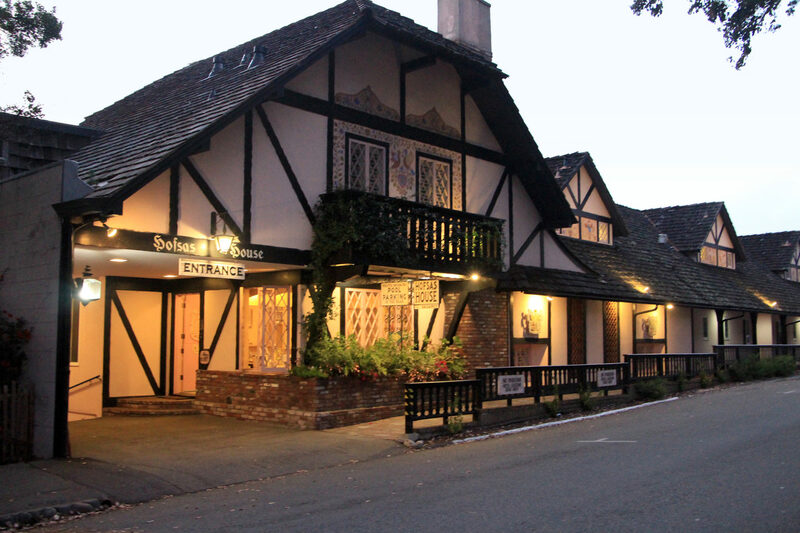 For over 70 years, the Theis family have been welcoming guests to Carmel and the Hofsas House Hotel. The distinctive, pink and black Bavarian-inspired lodge is impeccably maintained and the level of service rivals that of far more expensive hotels. The hotel was founded in 1947 by Donna Hofsas and retains many of her personal touches, including the Bavarian-themed mural painted by her friend, artist Maxine Albro. Today the hotel is run by Donna’s granddaughter, Carrie Theis, who first began helping her grandmother at age eight and continues her grandmother’s tradition of personalized service and gracious hospitality. Each of the hotel’s 38 spacious guest rooms are comfortably furnished and feature Dutch doors that can be opened to welcome the ocean breeze. Many of the rooms feature wood-burning fireplaces, kitchenettes, and/or private balconies. 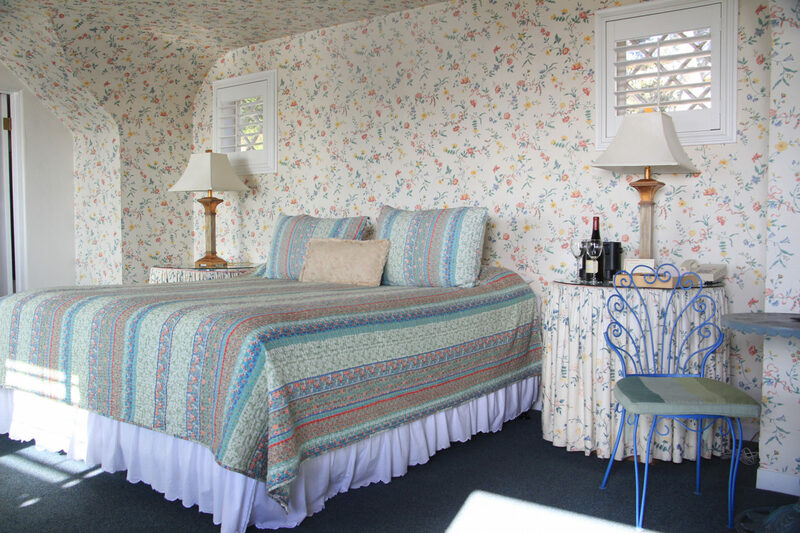 I stayed in room 43, which is decorated like a spring bouquet and offered ocean views above the cypress trees. The airy room also featured a wood burning stove, a fully equipped kitchen, and retro-pink tiled shower and pink vanity. 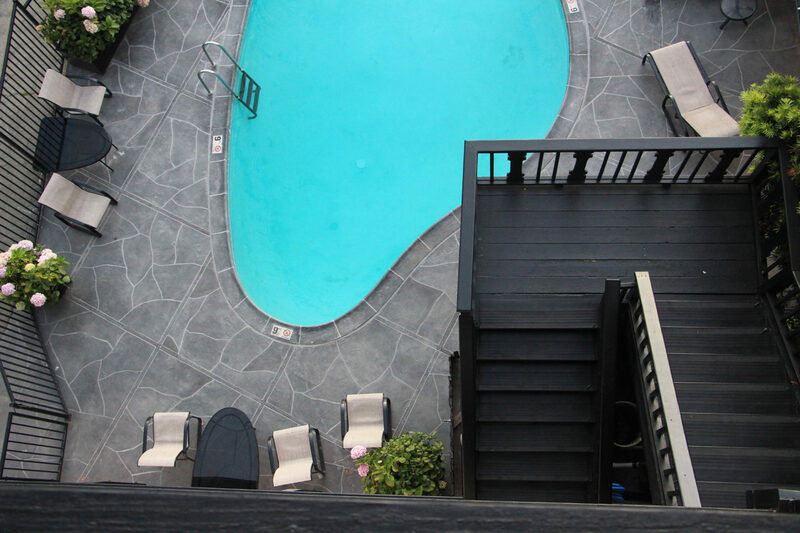 The family-friendly and pet-friendly hotel boasts one of Carmel’s few heated swimming pools as well as European-style dry saunas. 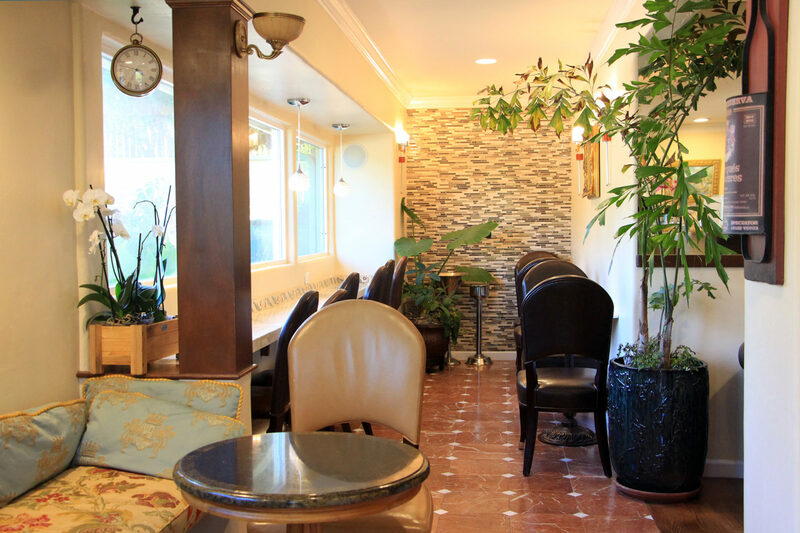 A complimentary continental breakfast is served each morning and includes fresh local pastries, fruits, juices, coffee, and tea. 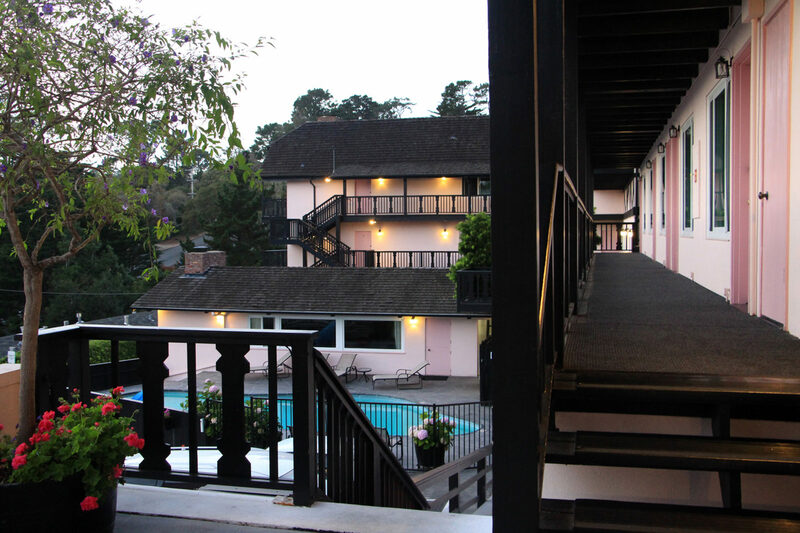 The Vendange Carmel Inn & Suites is a small boutique inn deeply rooted in Carmel’s wine culture. 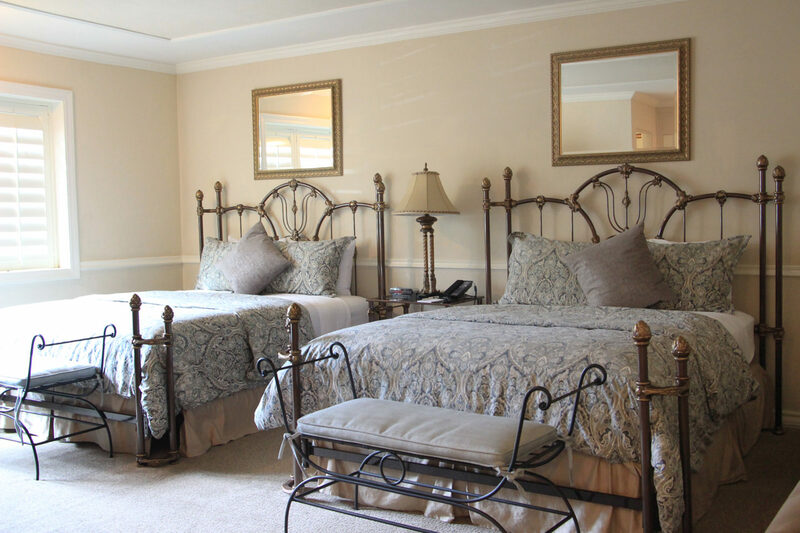 Each of the 20 guest rooms are individually decorated as an homage to a local Carmel Valley winemaker. The rooms feature mini wine bars with unique selections of wines that are only available for purchase at the inn or at the winery’s tasting room. In the evenings, the inn offers tastings of local wines from a different winemaker each week. The guest rooms are contemporary in their design, featuring modern furnishings, beautifully-tiled baths, patios or balconies, and wine-related art and photography. 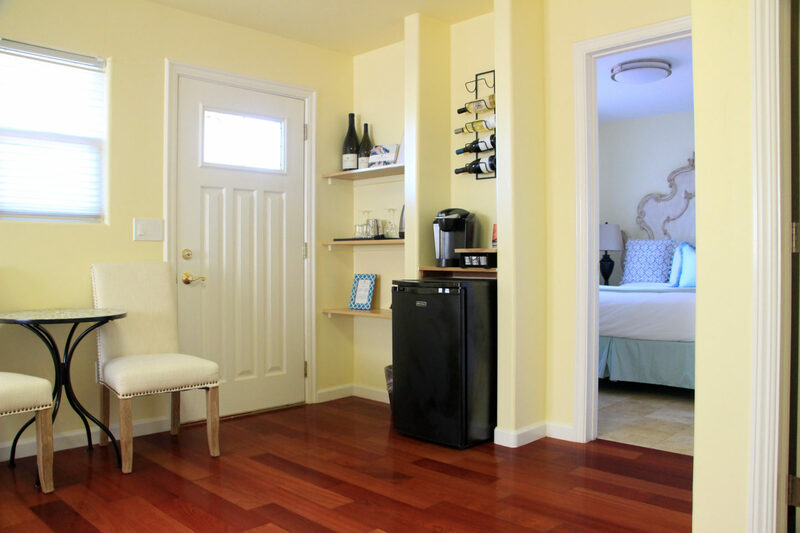 The rooms are equipped with Keurig coffeemakers, tea kettles, small refrigerators, wine glasses, and bottle openers. 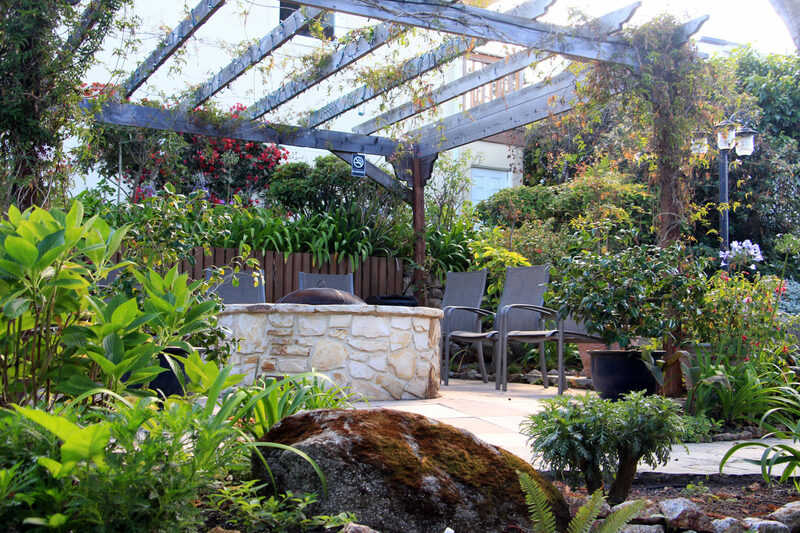 The guest rooms are housed inside a small collection of red-tiled roof buildings with a central courtyard featuring lovely gardens and a fire pit. A complimentary breakfast is served each morning in the lobby. The Vendange Carmel sits on a rise at the edge of the village, but is still within walking distance of Carmel-by-the-Sea’s shops and cafes. Nestled in a tranquil, residential neighborhood just one block from the beach, guests of the Colonial Terrace can be lulled to sleep by the sound of the ocean. The inn is a bit removed from the hustle and bustle of the village, but still within a 15-minute walk through the neighborhood to Carmel’s boutiques and restaurants. A stroll along the Scenic Bluff Path overlooking the beach and Carmel Bay is a slightly longer walk into town, but well worth it for the views. The innkeepers thoughtfully offer flashlights to guests for the walk back after the sun has set. Beach umbrellas, beach chairs, beach blankets, and sand castle building toys are all also available to guests for enjoying a lazy day on the white sand. 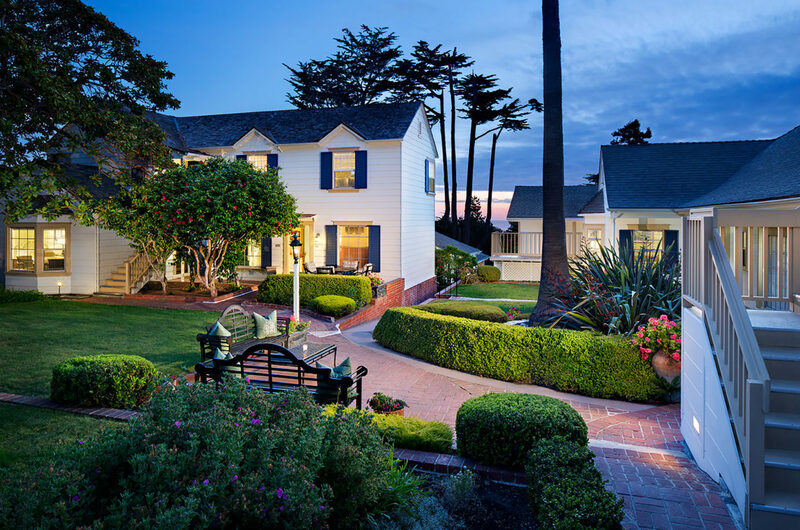 Built in 1930, the Colonial Terrace is one of Carmel-by-the-Sea’s original hotels. 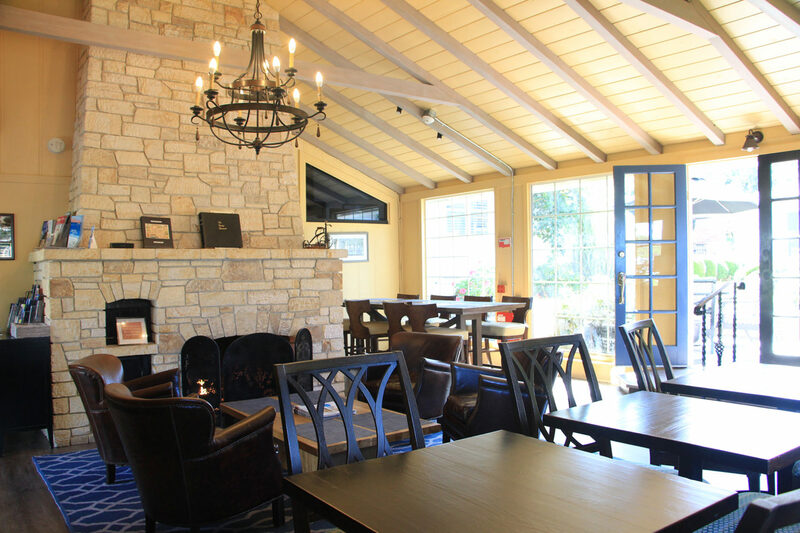 Decorated in cheery yellow and blue hues with traditional furnishings, the inn’s 28 guest rooms are housed in seven buildings connected by terraced gardens and brick courtyard patios with outdoor fireplaces. 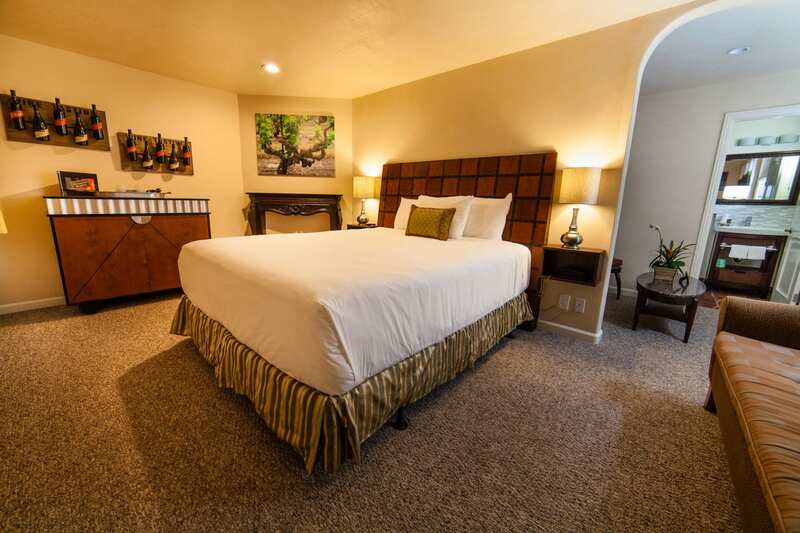 All of the rooms feature flat screen televisions with DirecTV and Keurig coffeemakers. Most offer gas fireplaces and refrigerators. Some also have views of the ocean. A complimentary, continental breakfast is served each morning in the lobby. 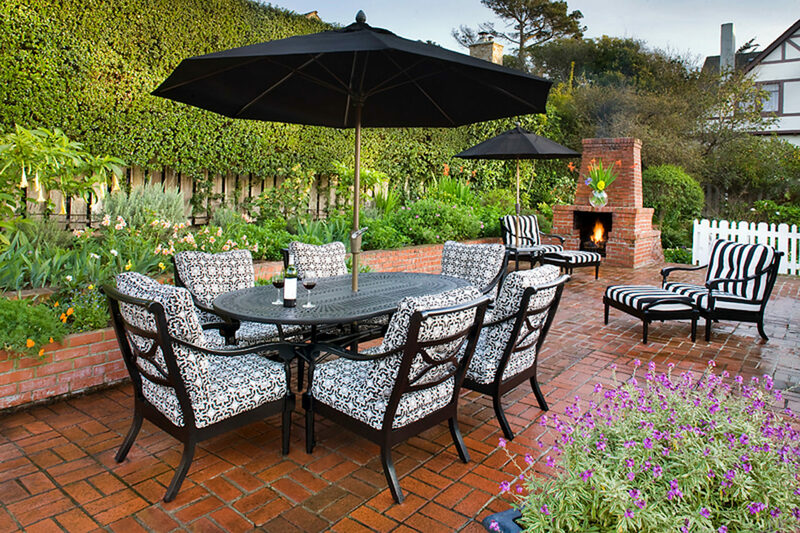 The Coachman’s Inn places guests in the heart of Carmel-by-the-Sea. Step outside and you’ll discover galleries, restaurants, and shops in every direction. The inn’s 30 guest rooms are elegantly decorated in a soft, neutral color palette with paisley-print duvet covers adding a touch of flair. All the of the rooms feature plantation shutters, fine linens, flat screen televisions, small refrigerators and microwaves. Many of the rooms also offer jetted spa tubs and gas fireplaces. The bathrooms feature white marble tiles and gold fixtures. 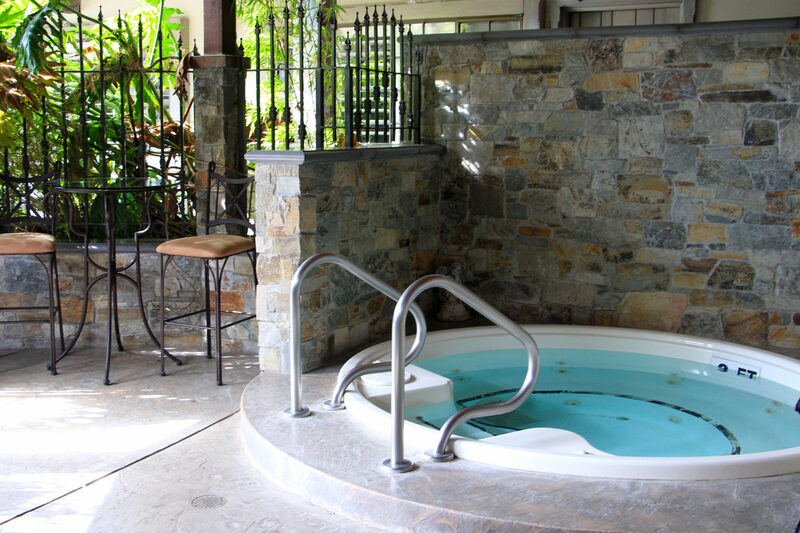 An outdoor hot tub and sauna is tucked away in the back corner of the property. 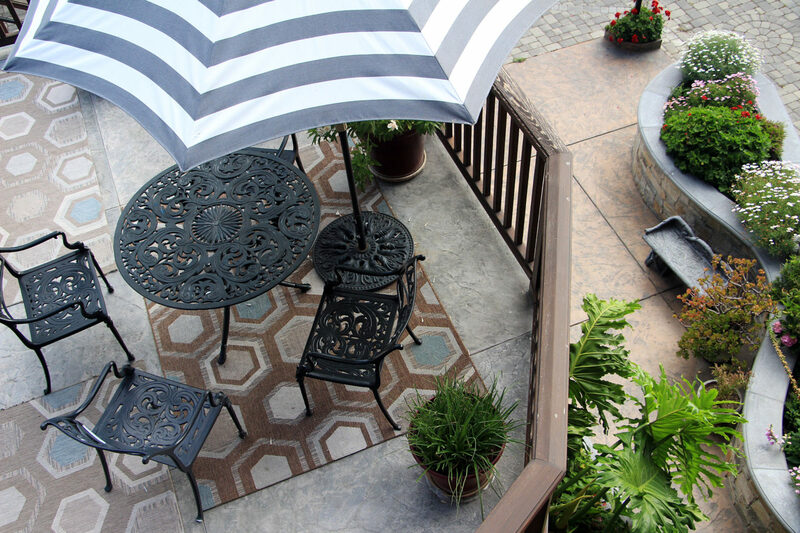 Several wrought-iron patio tables and chairs are set along the inn’s terraces and balconies with hanging baskets and planters spilling over with colorful blooms. 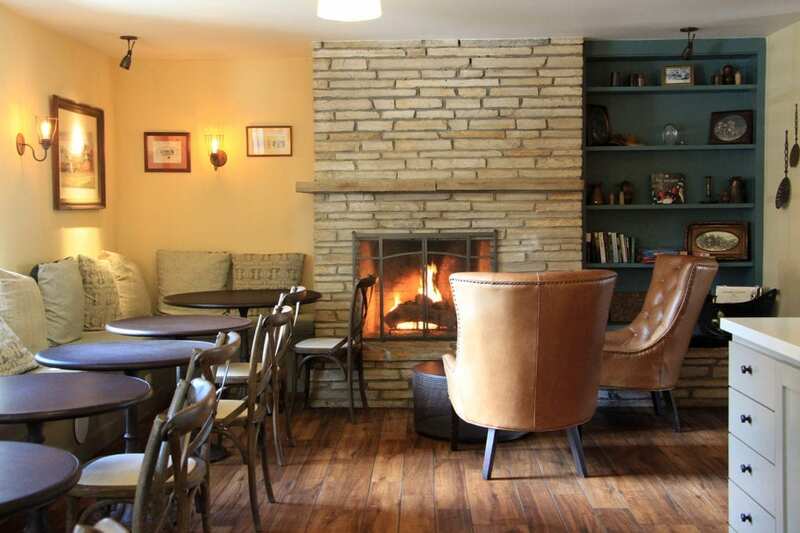 A full breakfast is served each morning in the lounge, which has a cozy tavern feel with its rock fireplace, Edison bulb light fixtures, wooden café tables, and benches lined with pillows. Some of the featured breakfast dishes are from the cookbook, The Kitchen at Four Sisters Inns. Freshly-baked cookies are available in the afternoon. In the evening, the innkeepers serve wine and hors d’oeuvres.